On a quest to make everyone’s poo better (& improve overall gut health), Aussie Mum Jeanie McClymont is literally mixing up an end to backed-up digestive systems! 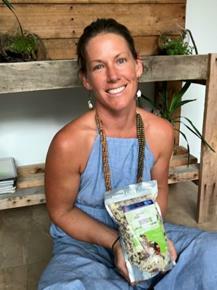 Drawing on her wealth of knowledge garnered working as a trained Naturopath in chemists and health food stores, Jeanie developed goodMix’s Blend11, her Australian made, best-selling functional food blend. To complement Blend11, Jeanie has been developing and perfecting the goodMix collection of five products since 2012 to ensure high quality and efficacy, but also versatility for customers. Blend11, NeoBlend, Pondwater, Bixmix and Ballbags are all notable for being gluten free, nutrient dense, high in fibre, antioxidant rich, zero refined sugars, high in plant protein and containing Australian grown & certified organic ingredients wherever possible. Whether you are craving a sweet treat or a highly nutritious meal, goodMix products offer flexibility and endless meal and snacking options. With just a few extra ingredients Blend11 transforms into a cauliflower, pumpkin, pinenut & paprika salad, or indulge in a guilt-free peanut butter cheesecake with BallBags. For the little and bigs kids, supergreen gummy lollies with Pondwater will be a special treat. Certified by Monash University as low FODMAP, the best-seller,Blend11 is a functional food booster that seems to make an ‘irritable bowel’ very happy. A simple but nutritious blend of chia, almonds, pepitas, coconut, buckwheat, flaxseeds, sesame seeds, goji berries, raw cacao nibs, puffed amaranth and puffed millet. Rich in diverse dietary fibre and ready to add to fruit, yoghurt, smoothies, shakes, muesli or cereal, Blend11 comes alive after it is moistened in water for a minimum of eight hours. Overnight soaking triggers the activation process, stimulates enzyme release and allows the seeds to easily pass through the digestive system making them nutritionally available. In the bowel, gut microbes ferment the fibres into short chain fatty acids (SCFA’s) which have gut-healing, anti-inflammatory & immune boosting effects. With four pack sizes including 100g – $6.00, 400g – $17.00, 800g – $32.00 and 1.3kg -$43.00. Neoblend: a nuttier, fruitier and grain-free alternative for today’s modern gatherer. This mix has been cleverly designed to supply maximum nutrition as well as delivering a fantastic and delicious variety of nuts, seeds and fruit to satisfy the gut microbiome in a Paleo-friendly way. Packed with coconut, almonds, chia seeds, linseeds, black sesame seeds, pepitas, banana, hempseed, brazil nuts, apricot, macadamia nuts, mango and goji berries. To promote ease of digestion and maximum nutrient absorption, it is recommended that Neoblend is also activated by the water absorption method. Pack sizes include 100g – $7.00, 400g – $21.00, 800g – $37.00 and 1.3kg -$55.00. ‘BallBags’: An incredibly healthy, quick, easy & versatile go-to base ingredient to satisfy & nourish every chocaholic. This raw cacao vegan protein ball pre-mix bag stretches way above and beyond the average bliss ball. Containing cashews, dates, apricots, raw cacao, raw cacao nibs, natural protein powder (pea isolate), almond meal, coconut, maca and mesquite. Simply add water or coconut oil to the mix and it is ready to be shaped into rich choccy protein balls or head to the website for recipe inspiration to produce slices, tarts, chunks and treats. Available in 2 sizes: 750g – $30.00 or 375g – $17.00, or 4kg catering packs for cafe’s / coffee shops / gyms etc. It’s easy being green with Good Mix’s Pondwater. Go supergreen and superclean with this extraordinarily nourishing & cleansing powder supplement, bringing together four of the most potent organic supergreens plus aloe vera. A quintet of spirulina powder, barley grass powder, spelt grass powder, chorella powder and aloe vera powder making green drinks, even greener! Containing Australian grown grasses (tested both just after harvest and at mixing stage to be gluten free), plus algae & pure-inner leaf aloe vera. For the purist add water and a squeeze of lemon or lime, alternatively try turning Pondwater into jellies or add to smoothies, shakes or fresh juices for an added boost. Perfect to add into any detox plan, juicing regime or green smoothie. Two sizes: 200g yields 80 serves @ $42.00 or 500g for $89.00 creates 200 serves. Whether a lover of deliciously clean non-processed foods or following a special diet out of necessity, goodMix delivers quality products suitable for many dietary requirements including vegan, vegetarian, coeliac, gluten intolerant, low carb, low sugar, keto, paleo, grain free and Low FODMAP diets.